The last decade has left people terrified of even the safest investment opportunities. This fear is not helping would-be investors who could be making money if they had a solid plan. The Little Book of Trading teaches the average person rules and philosophies that winners use to beat the market, regardless of the financial climate. Most importantly, The Little Book of Trading explains why mutual funds should not be the investment vehicle of choice for people looking to secure retirement, a radical realization highlighting the changed face of investing today. 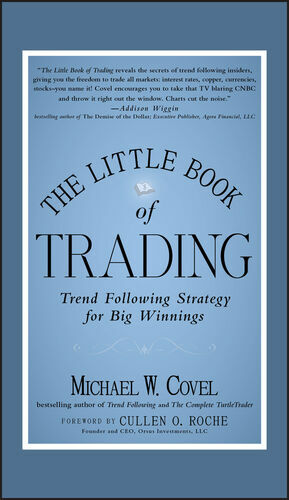 Michael W. Covel serves as President of Trend Following (www.trendfollowing.com), a privately owned research firm. His first book is Trend Following: Learn to Make Millions in Up or Down Markets, and his second is The Complete TurtleTrader. He also founded TurtleTrader.com® in 1996, and since then, it has grown into an internationally recognized archive of trading information and data visited by over 10 million users. His first documentary filmBroke: The American Dream, about the 20072009 crashwas released in 2009 and premiered on The Documentary Channel.